Item model number: OC3. Boss OC-3: Super Octave. New Drive mode adds distortion to octave notes for a fatter, more aggressive tone. Boss OC-3: Super Octave. New Drive mode adds distortion to octave notes for a fatter, more aggressive tone. The Boss OC-3 SUPER Octave Pedal is the world's first compact pedal with true polyphonic octave effects! With Polyphonic Octave mode, drive mode with distortion, and the original OC-2 mode, this is the most versatile octave stompbox ever. 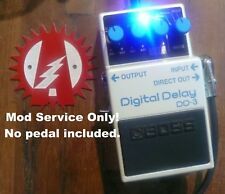 BOSS Dd-5 Digital Delay Guitar Effect Pedal. Boss OC-3 is a good unit that does what it is supposed to do. Bought this used. Since it didn't come with instructions, I had to go to YouTube and got great help on showing me how to set the Boss OC-3 for different settings and got that sound I was looking for. I did have to order an AC power plug for it. Battery operated. Uses 9V square. I bought this to fatten up my bass guitar sound when playing in the upper register. I plugged in a guitar and have fallen in love with the sound playing stereo through bass and guitar amps. Tracks really well. The poly setting is surprisingly useful. For those of you looking for a quality and versatile octave divider for good value, I highly recommend the BOSS SUPER OCTAVE OC3. It has a very pronounced sound and a variety of different settings to dial in the effect you want. awesome little pedal...it also sustains and holds the octave more than a MXR octave pedal. I read so much reviews than bought one and am not disappointed go get one asap !!! !